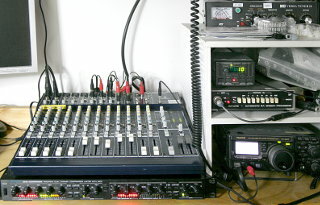 I have a Behringer Eurorack MX2004A mixer that will be used for interfacing between my PC, broadcast radio tuner, amateur radios, various microphones and my speakers. For certain complex reasons, I'll want to use four of the mixer's mono channels as independent microphone preamps with equalizers, i.e. I want the amplified mic audio out of the box without it going into the main mix. The Insert jacks can do this, but they are pre-Eq. That is, the signal comes to the Insert jack before going through the Equalizer. I wanted post-Eq Inserts. Other people have done similar modifications, converting Inserts into post-Eq Outputs, but I also wanted to maintain the possibility of injecting an audio signal back into the mixer. Using four channels as mic preamps/equalizers only leaves the AUX/Pan/Fader sections free to be used e.g. as two extra stereo input channels—albeit without Eq. Thus I wanted to keep the Insert as an Insert, not change it to an Output only. Thus: Modify the mixer my own way. :) I had already performed a custom modification on my Eurorack UB502 mixer to change the way its headphone volume control works. This mod turned out to be quite simple as well, requiring very few parts (two capacitors and one resistor per channel), but it did require major disassembly and reassembly of the mixer, which was not an easy task! This (much simplified) block diagram shows how a mono input channel is wired in the MX2004A. Note that AUX1 is switch-selectable as pre- or post-Fader (shown pre-Fader here), whereas AUX2 is usually hard-wired post-Fader. However, I modified AUX2 to also be pre-Fader, as per the manufacturer's instructions on page 24 of the User's Manual. The Insert modification I wanted to perform is shown in red: Basically isolate the Insert jack, bypass it, then cut the signal path after the Eq and insert the Insert at that point. Looking at the schematic for mono channel CH1, it's immediately obvious that C341 is the ideal new location for the Insert. Removing that capacitor from the circuit board neatly cuts the signal path right after the Equalizer, and wires going to the Insert jack are easy to attach there. Note that a similar capacitor must be provided in the modification (C2 in the diagram), and good form requires duplicating the output network (C161 and R302; or C201 and R301) that the original Insert jack had—thus the extra R1 and C1 in the diagram. To open the chassis, remove four screws from both sides (but not the ones holding the plastic front part). Then turn the mixer upside down, and open the three screws at bottom front, and three at bottom back (but not the two recessed ones in the area that gets hot during use). Now lift up the bottom half of the chassis, front-side first, being careful not to yank off the wires going to the power supply module, which is mounted on the bottom. Removing the main board from the chassis is a pain, as you need to pull off all of the 97 potentiometer and 15 Fader knobs, and all 50 pushbutton hats, unscrew all 25 phone jacks on the top side, and remove all the retaining screws from the top-side XLR jacks and RCA connectors. Finally remove all 26 screws holding the main board (from the circuit board side, not from the top side). You'll also have to remove the rear connector board, so unscrew its phone jacks and XLR connector screws as well. Also be warned that getting the main board back in place will be a major pain! You may want to learn a couple of new swear words before you begin. 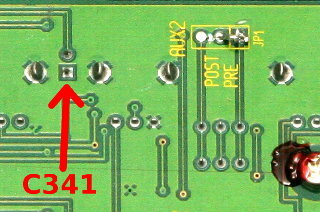 This is the location of capacitor C341 (see the full image) for CH1. The square pad is negative, the round pad is positive. Remove it, and clean up the pads with desoldering braid. This cuts the connection between the Equalizer and the Pan control. Do the same for all other channels you wish to modify. 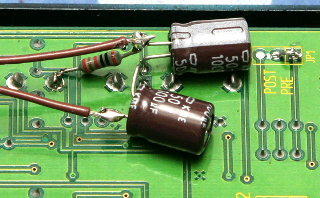 The corresponding capacitors (C342...C348) for the other channels are in similar locations, as all eight mono channels are identical. Now the circuit board can be reattached to the chassis. All the potentiometer shafts can be surprisingly difficult to align to their corresponding holes, not to mention all the phone jacks! The thread surrounding the jack gets caught on the edge of the hole in the chassis, making the operation darn near impossible! How the fsck do they do this at the factory??? Once things begin to fall into place, insert a couple of screws to hold the circuit board. Now wiggle the jacks one at a time to try to get them seated properly. Remember to swear a lot. Loosely attach locking nuts to the jacks whenever possible, to prevent them from slipping out again. When almost done, remember to wiggle the XLR connectors to align them properly also, instead of just tightening everything down with force. When everything is properly seated, attach and tighten all the screws holding the circuit board and the XLR and RCA connectors, and tighten the locking nuts on all jacks. Then reattach the rear connector board. Now you can also reattach the potentiometer knobs (don't you wish you had somehow made note of which color knob goes where? ), Fader knobs and pushbutton hats. Now assemble the new output network consisting of C1 and R1 (see the above block diagram), and the input blocking capacitor C2 (ditto): Solder the positive leg of C1 to the positive (round) pad on the circuit board, where C341 used to be. Solder one end of R1 to the other leg of C1. Solder the other end of R1 to ground—that's the big solid areas of the PCB. Any convenient grounded point is fine, I used a joint where the case of one of the potentiometers was soldered to the ground plane. Connect the negative end of C2 to the negative (square) pad on the circuit board. Two wires will go from these components to the Insert jack on the back panel. Attach one wire to the point between C1 and R1—this wire will go to the tip terminal of the jack (see below). Attach the other wire to the unconnected leg of C2—this will go to the ring terminal of the jack. Do the same for all other channels you wish to modify. 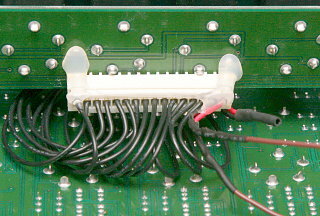 The Insert connectors are on the rear connector board, and they are connected to the main board via the 16-pole connector with one red and 15 black wires. Beginning at the red wire, the wires are CH1 ring, CH1 tip, CH2 ring, CH2 tip, and so on. 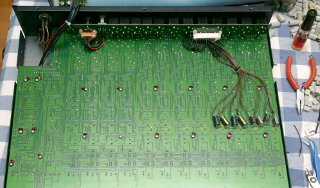 For each channel you wish to modify, cut both wires, and connect the ones going to the main board directly together. This bypasses the Insert connector between the Gain and Eq stages. Do this one wire pair at a time, or you will lose track of which is which. Now connect the tip and ring wires coming from your C1 / R1 / C2 assembly to the corresponding wires going to the rear connector board. 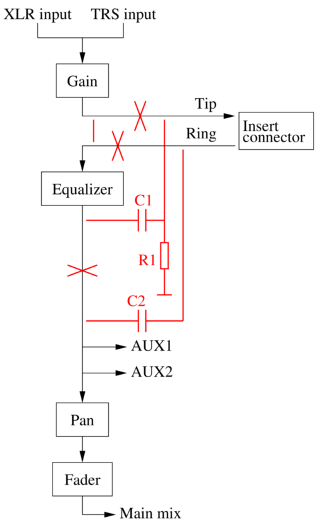 This restores the connection between the Equalizer and the Pan control through the Insert jack, thus completing the modification. Cover up your connections with heat-shrink tube. The photo shows one channel (CH1) already modified. I modified four of the eight mono channels on my mixer. When done, I gooped up the capacitors with hot-melt glue to make sure they don't shake around creating short circuits, and bunched up the wires neatly. Make sure you leave no bits of wire anywhere to cause shorts. Nor should you leave any stripped insulation or other garbage rattling around inside the mixer, or you'll never get peace of mind... Reassemble the mixer and test it. If all has gone well, the modified Inserts are now post-Eq. Any unmodified ones should work just as before (i.e. pre-Eq). The audio levels (both input and output) of the modified Inserts should be the same as before modification. No other features of the mixer should be affected at all. And, for the record, this modification works the same, whether or not you've performed the AUX2 mod.